A diode is a semiconductor device that essentially acts as a one-way switch for current. It allows current to flow easily in one direction, but severely restricts current from flowing in the opposite direction. 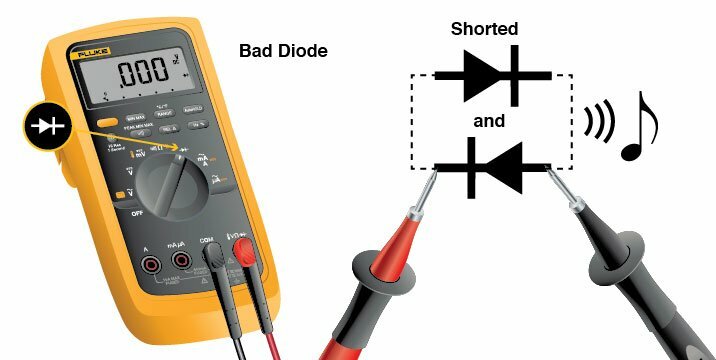 Diodes are also known as rectifiers because they change alternating current (ac) into pulsating direct current (dc). 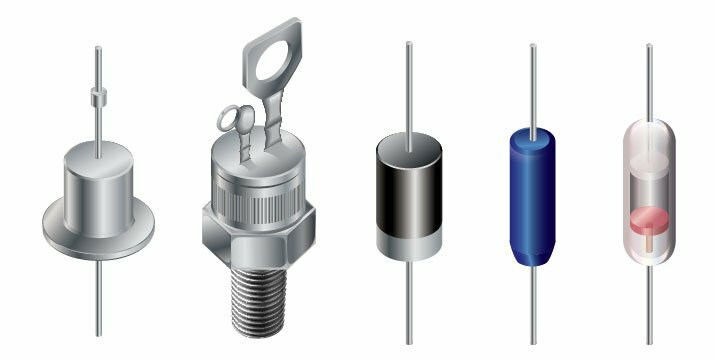 Diodes are rated according to their type, voltage, and current capacity. Diodes are available in various configurations. From left: metal case, stud mount, plastic case with band, plastic case with chamfer, glass case. 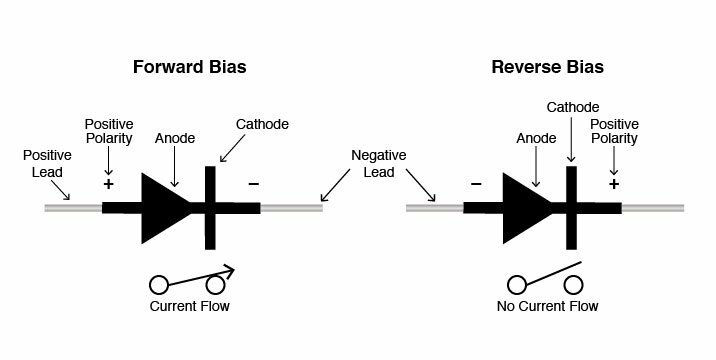 When a diode allows current flow, it is forward-biased. When a diode is reverse-biased, it acts as an insulator and does not permit current to flow. 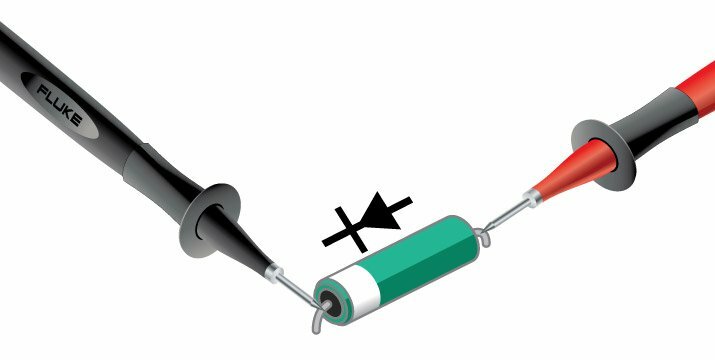 Strange but true: The diode symbol's arrow points against the direction of electron flow. Reason: Engineers conceived the symbol, and their schematics show current flowing from the positive (+) side of the voltage source to the negative (-). It's the same convention used for semiconductor symbols that include arrows—the arrow points in the permitted direction of "conventional" flow, and against the permitted direction of electron flow. 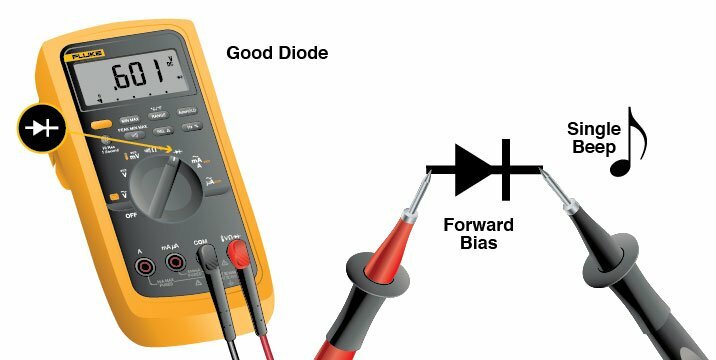 A digital multimeter's Diode Test mode produces a small voltage between the test leads sufficient to forward-bias a diode junction. 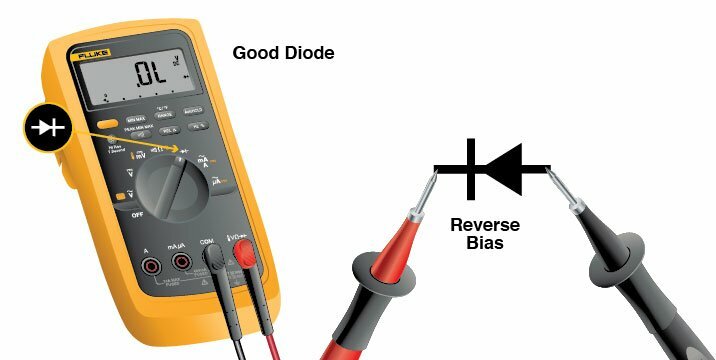 Normal voltage drop is 0.5 V to 0.8 V. The forward-biased resistance of a good diode should range from 1000 ohms to 10 ohms. When reverse-biased, a DMM's display will read OL (which indicates very high resistance). Diodes are assigned current ratings. If the rating is exceeded and the diode fails, it may short and either a) allow current to flow in both directions or b) halt current from flowing in either direction.